Lao Pdr : Amnesty International publish briefing document on Sombath’s disappearance !! Laos must ensure return of disappeared civil society leader !! The Lao government must act now to ensure the safe return of civil society leader Sombath Somphone, who is most likely a victim of an enforced disappearance at the hands of the authorities, Amnesty International said in a new briefing issued today. The briefing, Caught on Camera, examines in detail the case of Sombath, who was taken away in the presence of security personnel on the evening of 15 December 2012 – six months ago – and has not been heard from since. The fact that Sombath was taken from a police post in the centre of Laos’ capital city and that the police there did nothing to resist raises very serious concerns. Rupert Abbott, Amnesty International’s Researcher on Cambodia, Laos and Viet Nam. “Based on the evidence, the most plausible conclusion is that Sombath Somphone is a victim of an enforced disappearance, for which Lao officials are responsible,” said Rupert Abbott, Amnesty International’s Researcher on Cambodia, Laos and Viet Nam. “They should also establish a new, independent commission to investigate the case, ensure Sombath’s safe return, and bring to justice in fair proceedings those suspected of being responsible for his enforced disappearance”. Under international law, enforced disappearances are defined as the arrest or detention of a person by state officials or their agents followed by a refusal to acknowledge that the person is being held or to reveal the fate or whereabouts of the person. Sombath’s disappearance was caught on camera – closed-circuit television (CCTV) footage that his family was able to record. The footage shows that Sombath was stopped at a police post in the Lao capital Vientiane. After he left his car to speak with police, his car was driven away. Three men including Sombath then got into a pick-up truck with flashing lights, which drove away behind a motorcycle from which the passenger seemingly fired a gunshot into the air. “The fact that Sombath was taken from a police post in the centre of Laos’ capital city and that the police there did nothing to resist raises very serious concerns,” said Abbott. The Lao authorities’ likely involvement in Sombath’s disappearance is further compounded by the failure of the police to conduct thorough investigations, which suggests a cover-up. Offers of external assistance, including to analyze the original CCTV footage, have been rejected. “The Lao government must act now to ensure the safe return of Sombath Somphone to his family – until it does, the criticism around his disappearance will not go away,” said Abbott. 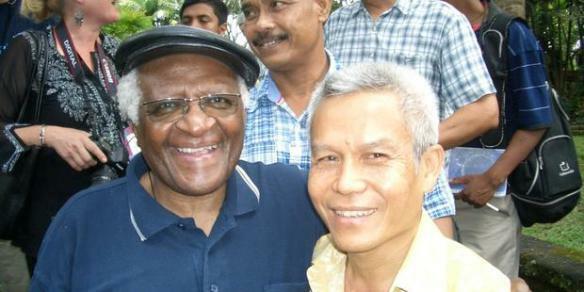 Shortly before his disappearance, Sombath carried out a nationwide survey to measure happiness throughout Laos, and took part in organizing the country’s largest ever civil society event – the Asia-Europe People’s Forum (AEPF) in October 2012. AEPF participants were harassed, and security officials confiscated copies of the document incorporating the findings of Sombath’s survey – “The Lao People’s Vision”. Soon after, on 7 December 2012, the Lao government expelled an international development worker after she had highlighted the limited space for debate in the country and the repercussions for those who speak out. “Sombath’s enforced disappearance appears to be a link in a chain of events designed to restrict civil society and freedom of expression in Laos,” said Abbott.